Written by Paradox under General on May 22, 2011 6 People are talking. Something that always surprises me is the convoluted story of my involvement with Uru. I had played Myst, Riven, and Exile earlier; and got Uru for my birthday in April 2004. Too late for Prologue, and before Path of the Shell had been released. My hours of curious internet searches eventually led me to a post on GoG about flymode, which linked to COBBS. COBBS was a funny place… a subforum on a non-Uru discussion board, and yet the source of almost everything we have today. I arrived there as things like the Python decompyling were still unfolding. PotS was released; Alcugs development progressed and UU was opened; and the tools improved. What strikes me now, looking back, is how little argument there was on COBBS. 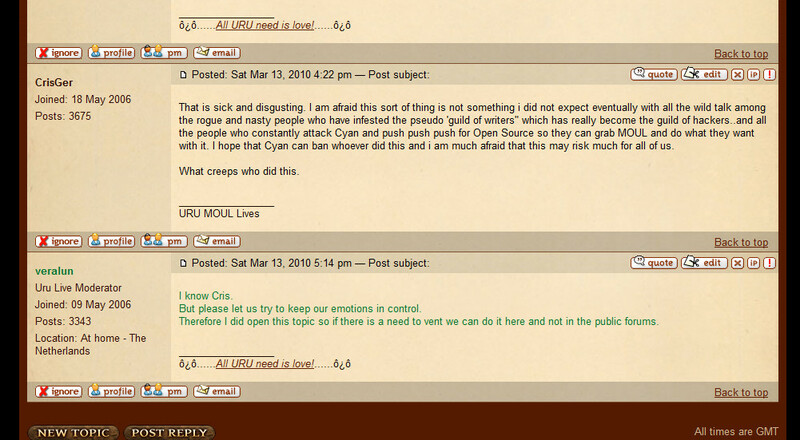 Maybe is was because Uru was really dead at that point so there was nobody defending Cyan (in fact, Chogon even contributed to a handful of COBBS threads, including the one linked above), or maybe it was because of how like minded we all were. For sure there were differences of opinion, but I don’t recall any sort of hostility in those early days. That did change as shards opened and people chose to associate themselves with particular shards. UU by far is responsible for a great deal of fracturing in the community. We splintered off of COBBS as PyPRP became available. The Alcugs forum for development discussions, The Writers Guild for creation assets, The New Tree for storylines and concepts, The Guild of Age Crafters for their planned expansion. Eventually these groups combined or dissolved into what became AgeBuilders. Funny enough, I don’t recall any big arguments at AgeBuilders either. Okay, there were storyline disagreements but those were always civil; and there was major explosive drama, but that wasn’t really an argument. So it’s 2006, and Cyan says Uru’s coming back, that’s gotta be a good thing, right? Since we’ve got tools now and a bunch of custom Ages, they’re even saying that they want to see user-created content. I swear there are 50 some-odd threads on the MOUL forum from those early days (before MOUL even opened!) where I’m trying to defend user-created content against all the naysayers. Even then, things were quite civil, there were valid concerns and there were valid examples in response. At that point, I don’t think too many people were paying attention to the user-created content issue, most people were just excited that Uru was back. There were some private discussions with Cyan around this time about the tools, and what they could do to work with us to improve them. One of the examples that was used (which still hasn’t actually been done) was a custom T-Shirt texture importer. MOUL changed a lot of things. With the shutdown of UU, there was no way to play newly created Ages online and a lot of anger from international players who weren’t in one of the GameTap-certified countries. A lot of server admins were also angry at Cyan, who had originally promised not to shut UU down. As Cyan updated MOUL’s engine code, our tools lost compatibility with the newer file format. By the time MOUL shut down, the file format had significantly changed 3 times since PotS. It was around this time Zrax started working on what became libHSPlasma, carefully adding support for all those different versions. Things seemed to go downhill when Cyan announced the Guilds. Suddenly our little Age building community was supposed to be a big organised entity, and if we didn’t do it fast enough, someone else would set up their own Guild of Writers without including all of the people who had been using the tools since their release. That week of setting up the forums, and trying to keep things under control was a bit of a nightmare. Still things proceeded reasonably well, aside from the compatibility issues in the plugin. When MOUL shut down, a lot of people were devastated, but for many of us it was just back to business as usual. UU still worked perfectly fine, with a few bugs, and there were tools to improve and content to release. Then Cyan wanted to have private discussions with us about a panel of GoW and GoMa to oversee Age creation licence approval. There was some pretty significant backlash against that when it was first announced publicly by Chogon, backlash which to this day has done irreparable damage to the perception of both GoW and GoMa. I remember being a bit resentful that after having these meetings and announcing the panel, Cyan just seemed to vanish and leave the Guild leadership to deal with the complaints and criticisms. Then that idea flopped, and Cyan announced open-source. Awesome, that was pretty much exactly what we wanted… except that we would have liked it back in 2008 when it was originally announced kthx. Since then, things have become decidedly more hostile. Everyone has their vision of what Uru should be, and is ready to outright attack anyone with differing views. As for Cyan, it’s disappointing to me that rather than hosting the source themselves, or on an established repository host (like BitBucket, or GitHub, or Launchpad, or SourceForge, or CodePlex, etc.) they put it in the hands of a group of fans. It’s also extremely disappointing to hear that certain people are getting extra content files and “early access” to things. Cyan should know better than to do anything that could be perceived as elitism, especially with regards to open-source. It seems that they don’t learn though, you need only to look at the continued moderation disputes on the MOUL forums to see that. As I’m reading through the MOUL forums while writing this, I honestly have to say that most of the responses over there make me depressed that I have to live in the same world as these people. The MOUL forums are the palace of stupidity of this community (to quote Tweek), and it astounds me that people like Main Avvie think that locking threads and never discussing issues is going to make problems go away. Go read Lontahv’s post here, and then ask why all the developers and builders are leaving the community. I’ve spent way longer on this post than I should have, and to put it bluntly: This community is not worth my time. It’s sad to see it reach this point, but I loathe the Uru community. It’s been coming for a while, but I look at the childish actions on both sides now and I can’t believe how pathetic it is that I’m still part of that. I have more worthwhile things to do than waste my energy on this brick wall. I’ve deleted my fork of Plasma on GitHub to make room for other projects. I still have a mild interest in seeing PyPRP for Blender 2.5, and seeing some of my creations in Plasma; but I have no interest in sharing those creations with anyone. Paradox, I´ve read most of the threads and postings you linked to, and I think I understand, how frustrating, angering and saddening all of these must be for you. I´ve seen such posts since years, mostly out of emotional moments, mostly out of ignorance. Most of those people who write these things aren´t “bad guys” per se. They are afraid. They are afraid, because they don´t understand, what you and many other developers do, how much work and heart blood you´ve spent into the projects we all are benefitting from right now, and will (hopefully) in the future. And I know, you and other guys have repeatedly tried to explain to them, unfortunately, they seem to not have understand, still. Fear makes people unjust, unfair, aggressive. Fear lets them say things they would refrain saying, if they would understand. I don´t try to justify their actions, not at all! I´m against any kind of poisonous communication, because – and we see this right now, and since some time – this causes so much pain in people, like you, who don´t deserve this. But, please – and I´m begging you! Don´t listen to those people. I know, how hard it can be to have to read such misinformed, aggressive and unjust posts, but don´t take them as “the community”! Many other people, including myself, are part of “the community” too, and we DO appreciate, what you are doing! I know, and this is a mistake we all make much too often, that it is much more likely to express negative criticism, than positive – I´m trying to change that for me, and I regret not having posted that a long, long time ago: I value all the work you do highly, and I know, that a lot of people feel this way. Without you, and people like you, we wouldn´t be making any fan ages, we wouldn´t have any open source, we wouldn´t have anything! I think, many of these fearful, aggressive people will learn, eventually, that they don´t have to fear, what you are doing. They will, ultimately, find out, that they were wrong prematurely attacking good-willed people. Until then, we should ignore them as best as we can. We shouldn´t let them destroy us, or what we love doing! Paradox, please, don´t leave! There is at least one person, and I know, there are many, many more, who DON´T see you and what you are doing the way the naysayers, ignorants and fearful people do! I´ve written this before in another instance: If someone wants to destroy your sand castle, don´t let them! It´s yours, and it is good, as it is! I understand your frustration, but at least open source URU allows you to fix most of the problems that Cyan won’t. Please, don’t leave. I always felt it was sad watching how quickly you turned bitter towards the community Doc. And yet at the same time I was pleased that it wasn’t just me that had a problem. So I tip my hat and say good for you for getting out of it all. Best thing to do these days. The community for years has been a nasty place, fighting every second, thankless, zealous, fanatical people screaming out until others are silenced in the din. I mean hell just look at the crap Crisger used to spew, I’ve got quotes from him that read like a fanatical religious person bent on harm. I mean really? That’s not how you talk about a community that is supposed to be friendly, wtf. But nothing is wrong, everything is utopian, problems are locked away and brushed under the rug and the delusion that everything is golden is pushed forward. Those who say otherwise end up demonized, trouble makers, slackers, trolls. And Cyan really don’t help in that regards, the way they treated people with UU, the DRC Liaison BS, the veralun issue. The MOUL forums are a complete and utter joke. It’s hard to have nothing but contempt for it all. The shelf life for Uru, Myst and Cyan has passed. Yet people continue to ride the corpse as far as they can go, thinking Uru will be a great MMO like WoW and others. Uru was a niche game, always was always will be, but heaven forbid you tell that to anyone. So no, I won’t be like others and say stay, I say run, go be happy leave the fools to their kingdom of corpses, with no means to bring life back because they drove all the help away. Grammatical inconsistencies aside, I find it’s rather fitting at the moment. Everyone’s content to let things happen, but when they reach their natural conclusion and someone walks away, suddenly it’s all praise and begging for them to stay. All a bit hypocritical IMO. I can only repeat: there are certain individuals who are like you described. Not everyone in the community, just certain individuals. Some people, maybe, never will change. But if you want to make your decisions because of these certain individuals, if you want to let THEM decide if you stay or leave with the community, than no one can stop you. I´d rather see you not leave, and that´s not meant hypocritically in any way. But if you want to make your decisions because of these certain individuals, if you want to let THEM decide if you stay or leave with the community, than no one can stop you. No, that’s the same logic that tells someone to stay in an abusive relationship because “it’s not all bad”.